Please join us for 2019 Summer Chess camps at Barrington High School on June 10-14 and 17-21. Please register by March15th for an early bird discount! List of upcoming tournaments: April 6 at Quest Academy (Palatine), May 18 at Elgin Academy (Elgin). Chess! Lessons From a Grandmaster! Chess! 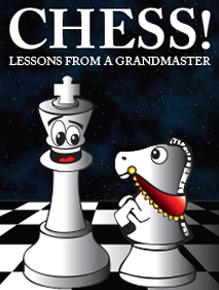 Lessons From A Grandmaster is now available on iPad! The book is interactive and is available on iTunes. To order a copy of the hardcover book, please visit our store.